Key Nutrients Cerebral Boost Review – Brain Fog Be Gone! Key Nutrients has perhaps one of the coolest label designs on the 2018 nootropic market, wrapping their bottles with an almost Bioshock-y, steam punk art-style. Which is somewhat fitting for a brain bio-hacking supplement. But you’re not here for shallow art criticism, are you? You’re here to know whether or not the formula inside of Key Nutrients Cerebral Boost bottle is any good. On that note, let’s get on with the Key Nutrients Cerebral Boost review to see if this nootropic supplement’s walk matches its talk. Who Takes Key Nutrients Cerebral Boost? Conclusion: Does Key Nutrients Cerebral Boost Work? Manufactured by veteran-owned Key Nutrients, Cerebral Boost is an all-natural brain support supplement for memory, focus, and clarity. Bacopa monnieri, the leading ingredient in this stack, is an awesome herbal nootropic for stress, memory, and learning. No caffeine or stimulants here. However, the formula’s use of L-theanine makes it a great nootropic complement to your morning cup of coffee. Other Ingredients: rice flour, magnesium stearate, hypromellose & silica. Directions: 2 capsules taken 1 to 2 times daily, or as directed by a healthcare professional. For best results, take daily for 30 days minimum. 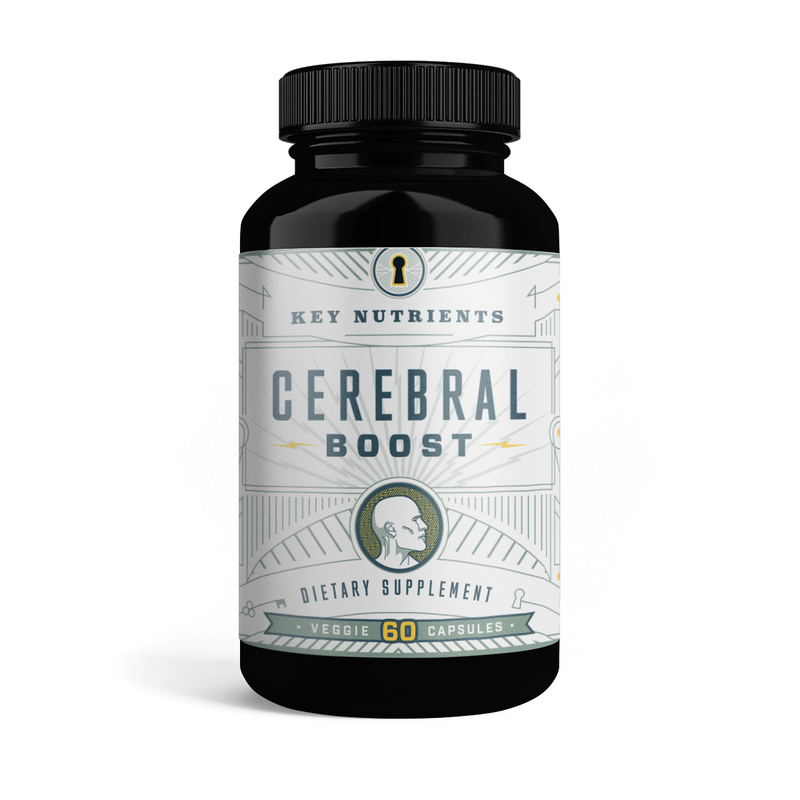 Compared to other supplements that share this ingredient profile (it seems like there are a lot these days), Key Nutrients Cerebral Boost does just a little bit better in the dosage department. But is this an ingredient profile that you’ll even want to take, good dosages or no? Let’s find out. Vitamin B12 (as methylcobalamin) – Good B12 form (better than cyanocobalamin) and a hefty enough dosage. B12 is key to a healthy cognition and, really, a healthy everything, as its involved in many, many bio-pathways. Vegans and the elderly require this vitamin, in particular. 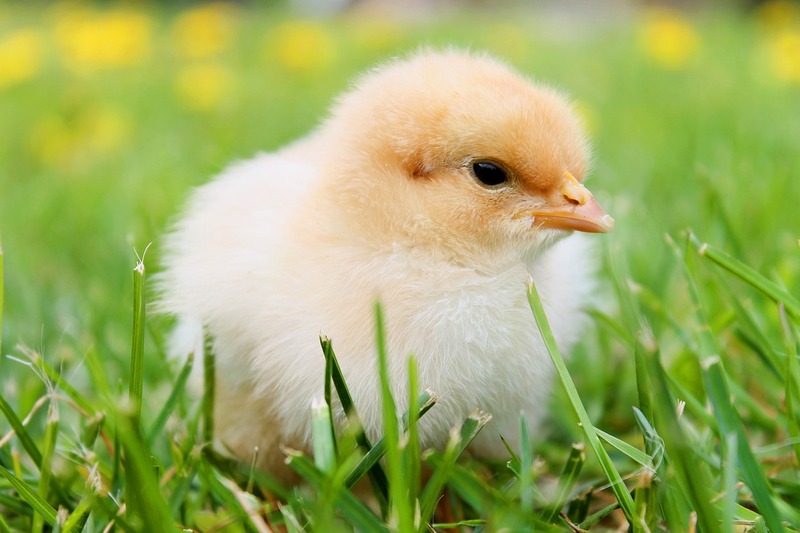 More on Vitamin B12. 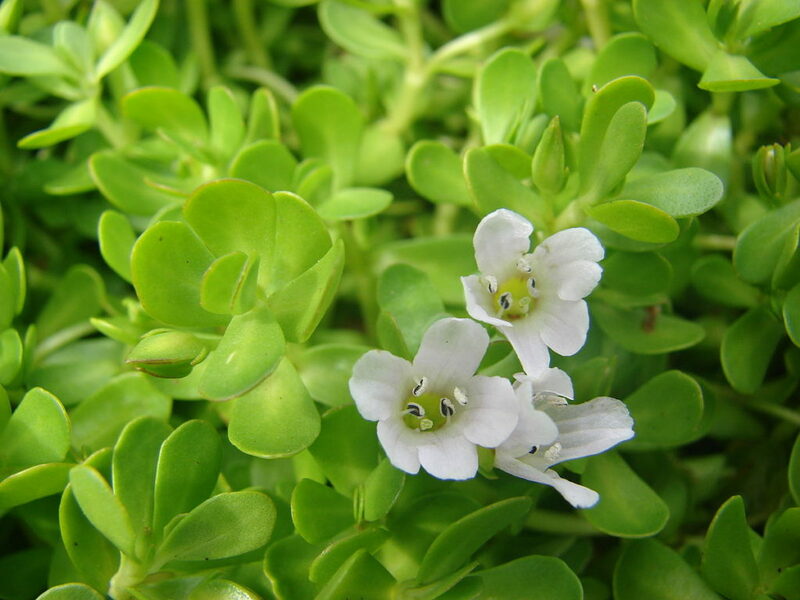 Bacopa Monnieri Extract – Smart choice by Cerebral Boost, investing a large portion of its capsule space to Bacopa monnieri, an Ayurvedic, adaptogenic nootropic with significant memory and learning boosting benefits. Great for students, academic and otherwise. More on Bacopa Monnieri. Phosphatidylserine (10%) – Why not supply 100 mg of 20% PS rather than 200 mg of 10% PS? Either way, this nootropic phospholipid is great for cognitive clarity and longevity. More on Phosphatidylserine. Ginkgo Biloba Extract – By enhancing circulation, Gingko seems to improve blood flow to the brain, fueling the brain with better oxygen and nutrients input. Additionally, this natural noot seems to improve working memory. More on Ginkgo Biloba. DMAE Bitartrate – I’ve been seeing this ingredient more and more, yet I’m not sure why. 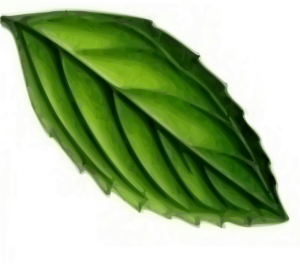 Data on this beauty compound’s nootropic potential has been scarce, and as far as I know no game-changing developments on this ingredient have been recently discovered. At most, it may help with concentration for those with hyperattention or neurodegeneration issues. For the average, healthy user, though, it’s hard to say. More on DMAE. Green tea, white tea, black tea — really, it comes down to the Camellia sinensis leaf. L-Theanine – I’m pretty happy to see this green tea amino in Cerebral Boost. L-theanine uniquely enhances alpha brainwaves, which have been associated with calm, creative thinking. What’s cool about this ingredient, too, is that if you mix it with caffeine, you may reduce caffeine’s jittery side effects while sustaining the focus benefits — more so than if you were to supplement L-theanine or caffeine alone. Purdy neat, right?! More on L-Theanine. Rhodiola Rosea Extract – One of my favorite natural nootropics, and perhaps my favorite natural adaptogen, Rhodiola rosea delivers fast-acting anti-stress, anti-fatigue benefits, resulting in quick boosts on mental and physical performance. There’s almost never a bad time to supplement this powerful nootropic herb. More on Rhodiola Rosea. I’m noticing a pattern with this ingredient profile. After doing however many nootropic supplement reviews that I’ve done, you notice patterns between supplements, such as a certain ingredient profile being accompanied by a certain list of brain health benefits. With Cerebral Boost, the pattern I’m recognizing is the use of Bacopa, PS, Ginkgo, DMAE, and Rhodiola with the cognitive benefit claims of Memory, Focus, and Clarity. It’s to the point that when I see these ingredients, my mind automatically thinks: “Ah! Memory, Focus, and Clarity” — which means that the marketing magic here has begun working on me. Fortunately, I’m smart AF and can counter marketing magic with my highly advanced intellect, which right now is telling me that… well, Cerebral Boost might actually be the real deal here. For one, Cerebral Boost makes a pretty significant addition to this common ingredient profile that is somewhat of a game-changer. I’m talking, of course, about L-theanine — an awesome nootropic that, while common to many brain health supplements, isn’t often seen with this particular list of ingredients. And for two, Cerebral Boost doses its ingredients fairly well, sticking to a simple stack of seven ingredients, leaving out all of the unnecessary fluff that needlessly detracts from the ingredients that work. Having said that, there is one unnecessary ingredient in this formula. I’m talking, of course, about DMAE — a not-so-awesome nootropic that doesn’t have enough clinical research under its belt to warrant its use in so many brain health stacks. This isn’t exactly a deal-breaker, but Cerebral Boost could do without it. Aside from that, Cerebral Boost is all-in-all a decent nootropic stack. Not the biggest or the bestest, but it’s enough for a subtle brain fog lift, clearing the mind for the second half of your shift, class, etc. Key Nutrients Cerebral Boost takes a somewhat common formula and does it better than other similar nootropic supplements touting the same brain benefits. By adding L-theanine but keeping caffeine out of the mix, Cerebral Boost gives its users the option to stack this product with their coffee or not. Cerebral Boost’s price shouldn’t break any bank accounts, potentially allowing its users to double down on the daily servings, if need be. For the most part the customer reviews are positive. DMAE is the biggest con for me. Not too sure why so many brain health supplements waste capsule space on this seemingly ineffective compound. The dosages are decent, but doubling down on the daily servings might be a low-key requirement to get the most out of this supplement — effectively doubling the price of this product. This is the pricing option listed at Key Nutrients. Other retailers may save you a couple bucks or so, but generally this product hovers around the $20 per bottle range. With an emphasis on mental performance — namely “Enhanced Memory and Mental Acuity” — Key Nutrients Cerebral Boost seems to target both academics and professionals. Really, just about anyone may benefit by these ingredients, with exception to DMAE. You can buy Key Nutrients Cerebral Boost through Key Nutrients website, as well as Amazon and Jet… and I think that’s about it? Haven’t seen too much on this supplement from other sellers and online retailers. Yes — of all the supplements that share this formula design, Key Nutrients Cerebral Boost is the most promising I’ve seen in awhile. Granted, it’s not the most complete nootropic design — nor is it anywhere near my favorite — but it’s a well-crafted, finely polished brain health supplement, nonetheless. Could it be better? Yes. Could it be worse? Yes, much worse. For the price tag, Key Nutrients Cerebral Boost is a valuable stack that’s at least worth a try, if you’re considering this list of nootropic ingredients. It’s cheap enough that you could add it to your other brain health stacks, too, which, if you’re a nootropic geek like me, is purdy cool.